Cedar Door have been manufacturing solid timber garage doors for over 25 years and sell their products through a wide range of well known suppliers, distributors and installers. 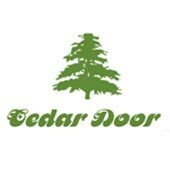 All Cedar Door products are 100% timber in a wide variety of styles from modern elegance to period designs all of which will enhance the appearance and beauty of your home. There is a natural warmth and elegance about the doors which is achieved by the skill of their craftsman. All doors are hand prepared and finished to the highest standards possible, as well as being fully factory finished to give a full weather protection. The outstanding range of touge and groove boarded doors enhance the appearance of any home.While they are extremely tough and durable they are also elegant and manufactured to the highest quality. Only the best Weatern Red Cedar boards to make our doors. The door frames are traditionally constructed using solid cedar stiles and rails, with all the joint construction is morticed and tenoned,glued and wedged, this is without a doubt the strongest joint method in door construction. This range of offers a much higher quality option to plywood. We use 20mm solid thick moulded Cedar panels which give a better texture as well as colour match to the stiles and rails of the wood frame . Stiles and rails, and all joint construction is carried out the same as with our other Traditional doors and frames.